Some of the feedback I have received indicate that this not widely known, so this post adds some more detail. You can clearly see that the main cluster of male athletes has done two or three IMs, while most of the women have done three or four races. Not all of this racing has been motivated by a desire to qualify for Kona – of course there are other reasons for racing such as trying to win an Ironman or to earn some prize money. Looking at those athletes with five or more races, I think that they were motivated more by trying to qualify than by making money: Only Sara Gross has made more than 20,000$ – she made 40,000$ by winning IM Brasil and IM Mt. Tremblant – but she to race Mt. Tremblant in order to qualify. In summary, the data shows that women Pros raced more often than their male counterparts. 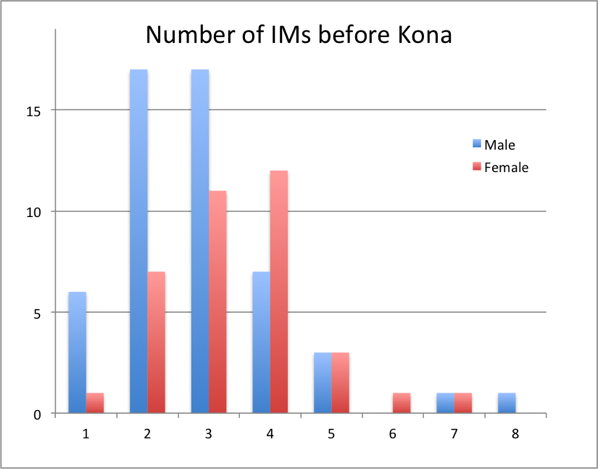 The data also indicates that this is a result of the lower number of Kona slots for women and the resulting higher number of points needed to qualify.